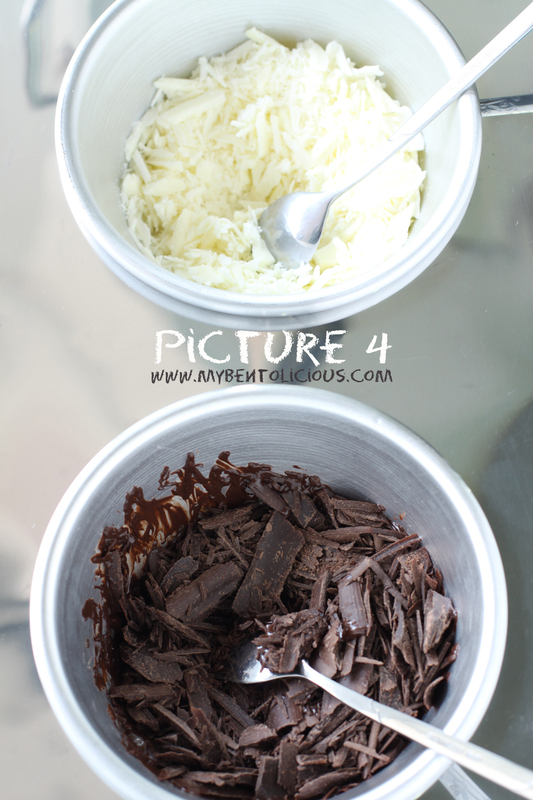 Finally, I took the pictures of my chocolate painting to share it with everyone. I am back in Jakarta from Semarang with a bad cough. Felt better 2 days ago and then am downed again. Yesterday was the worst, couldn't stop coughing since morning and had trouble to sleep. My sister and her family are staying in my parents' house until Sunday. I hope I can catch up some rest and sleep during this weekend. I got the idea to do chocolate painting from Wilton YearBook. 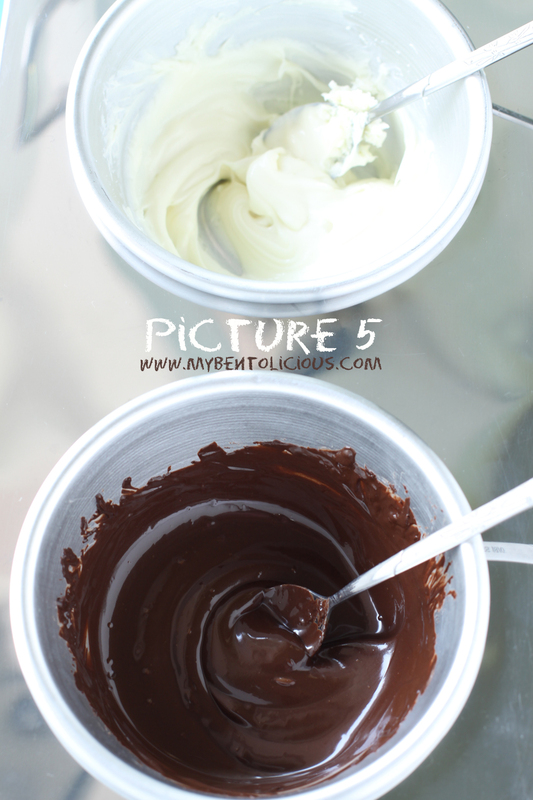 In the book they use icing sugar to paint, I chose chocolate for painting. I'm not a pro on this. 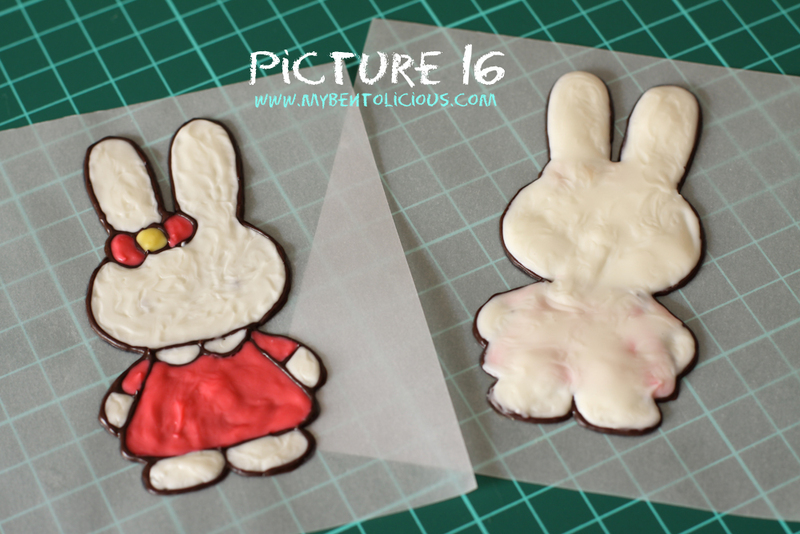 You can see that my outlines still 'struggle' there :) Hope the following pictorial can satisfy some of you that have been emailing me asking about how I do chocolate painting. 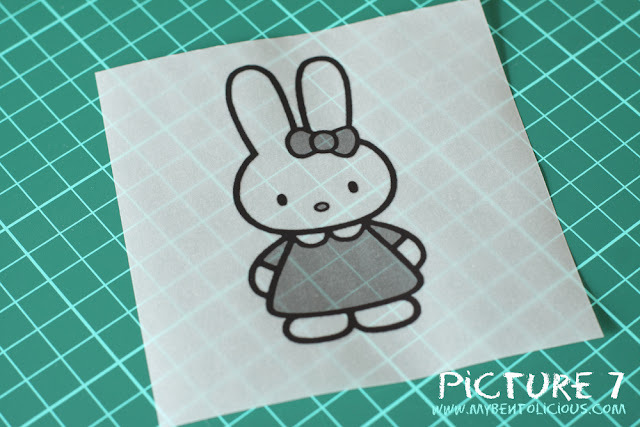 (1) Print out the picture on tracing paper, parchment paper, or wax paper. (2) Cut the chocolate with one hand grasped the handle of the knife and the other hand placed midpoint on the back of the knife (push the knife down). Gradually move the knife across the block of chocolate. (3) Prepare all the colored chocolates that you want to use. 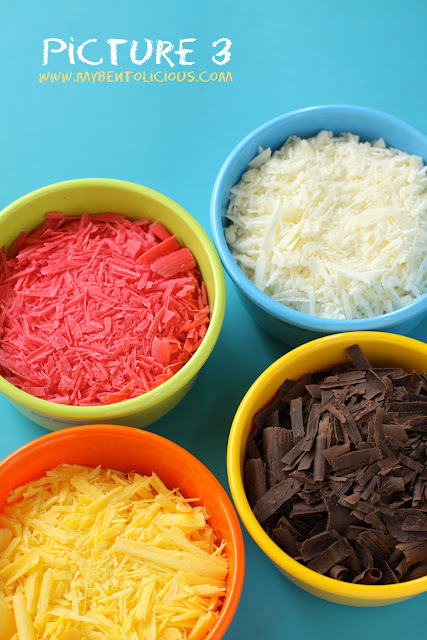 (4) Melt the chocolates one color at a time with double boiler, microwave, chocolate melting pot or other melting method that you are comfortable with. 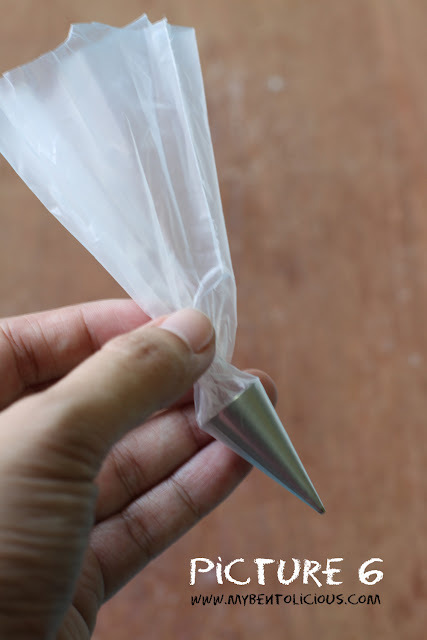 (5) For outline, you can use Wilton's round tip number 1 with disposable decorating bag. 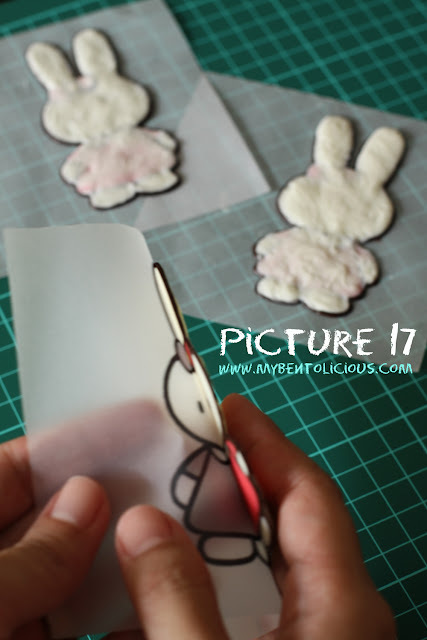 (6) Prepare the print out picture. 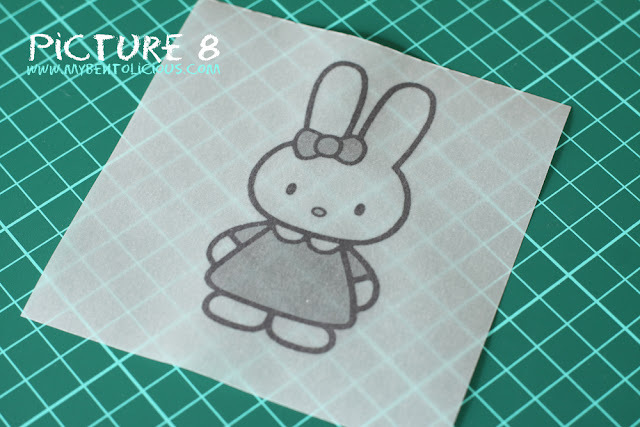 Turn the picture for painting (picture 8). (7) Make the outline first. 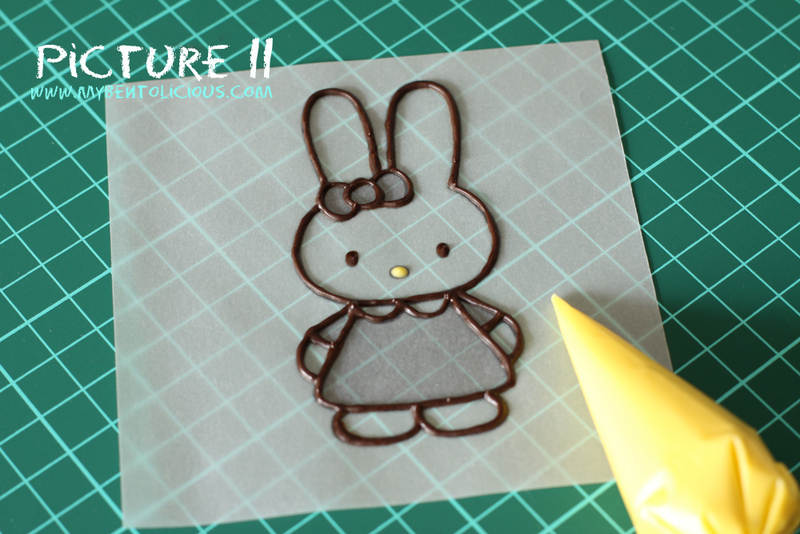 Remember not to use the hot melted chocolate right away for the outline because we want the outline stand still instead of going everywhere. 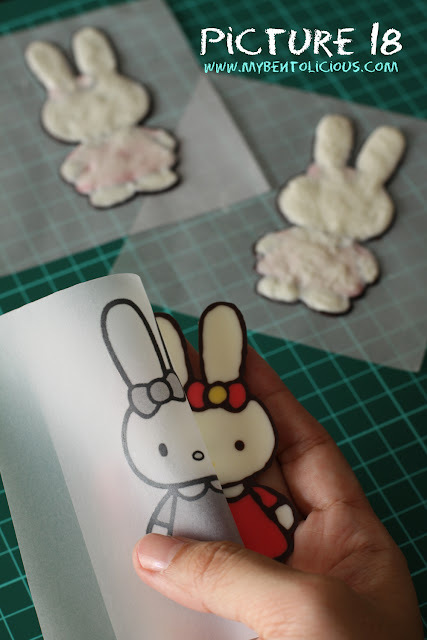 Test it on other paper first, if too runny wait for few minutes until the chocolate cooled down a little bit. Leave it to cool down and harden for few minutes before we start fill-in. 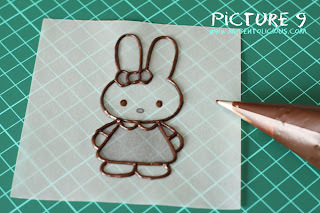 (8) For the other chocolate colors to fill in, no need to use Wilton's tip. 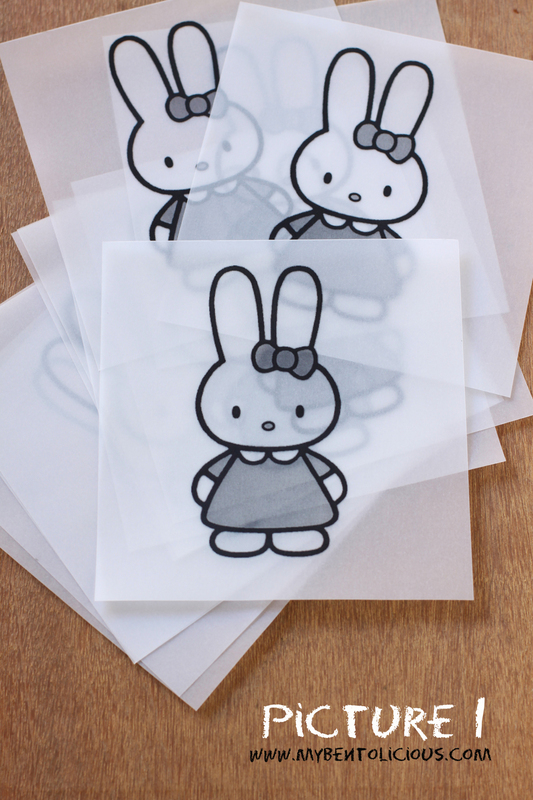 Just cut away a little bit on the edge of the disposable decorating bag. 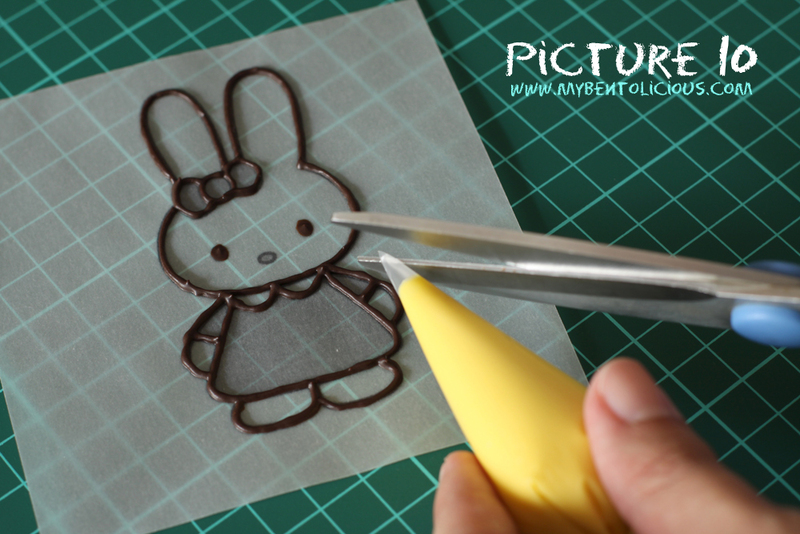 Don't cut too much, better to make a small cut first and if the chocolate is hard to come out then you can cut more later. (9) Paint each part with the different colors. Remember to melt the chocolate one at the time because chocolate is easy to get harden. Tooth pick can be used to push the chocolate to the edge (picture 12). To avoid bubble in the chocolate, tap the table few times in between fill in process. (10) When all parts are already filled with chocolates, cool it down. You don't need to put it on the fridge to cool it down. Just put it on the table at the room temperature for few minutes. 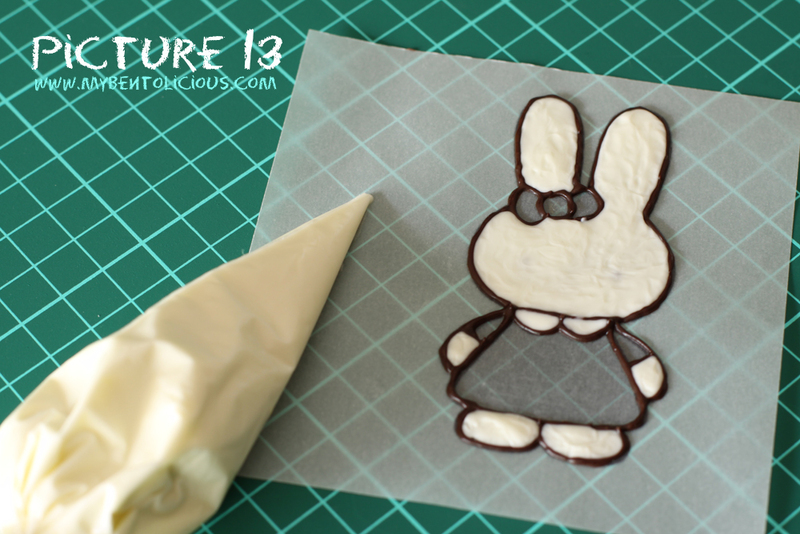 Don't worry too much if the chocolate looks wavy or wrinkled, as long as you fill in everything. 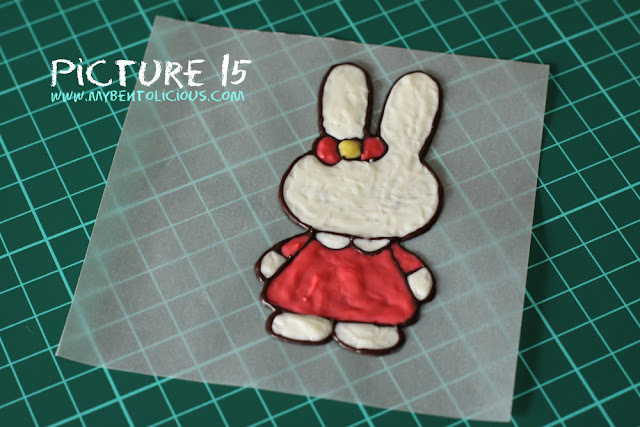 (11) Last step, cover the painting with the white chocolate as shown in the picture 16. Let it cool for few minutes. Don't use overheated chocolate if you don't want your work ruined. 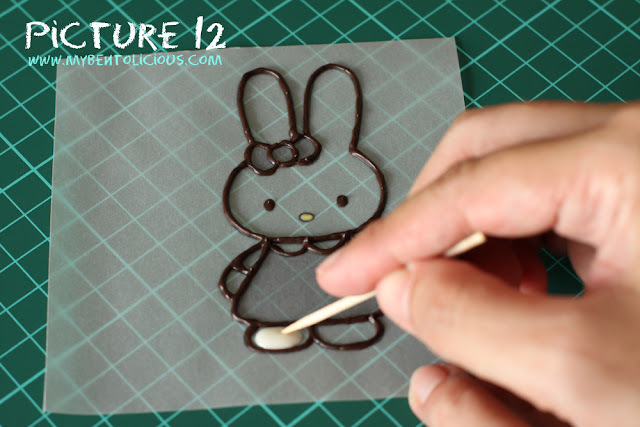 (12) Carefully separate the paper from the chocolate. Don't hold the chocolate too long with your hand as it will melt quickly. 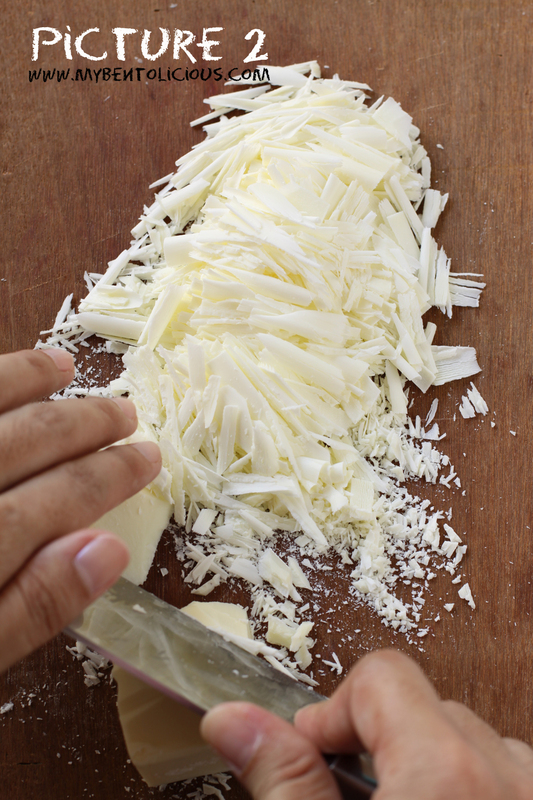 Move it to a plate, wrap the plate with cling wrap. It won't melt in room temperature. I love these posts! Thank you so much for the step-by=step tutorial. This is an amazing technique. Where do you find rainbow chocolate??? @OhayoBento : Thanks a lot Heather! I bought them at baking supplies shop. Alternatively, if you can get Wilton's product then you can use Candy Melts too for this :) Unfortunately, I can't get Candy Melts here. @Belle : Thanks a lot Belle! @Bentobird : Thanks a lot Jenn! The rainbow chocolates tastes sweater and each one of them have a different flavor (red-strawberry, green-mint, yellow-lemon, etc. ...). @tatabonita : Ng berani deh panggil Bu Guru datang cuman buat baby sit hahaha :D Hayo, kapan ke Jakarta? hey tks for sharing this - u make it look too easy!!! btw didn't know u could get so many beautiful coloured chocs - lovely pics too. And I love your chocolate blocks!!! We don;t have that many colors here... only boring white, pink and orange... love the RED one!! 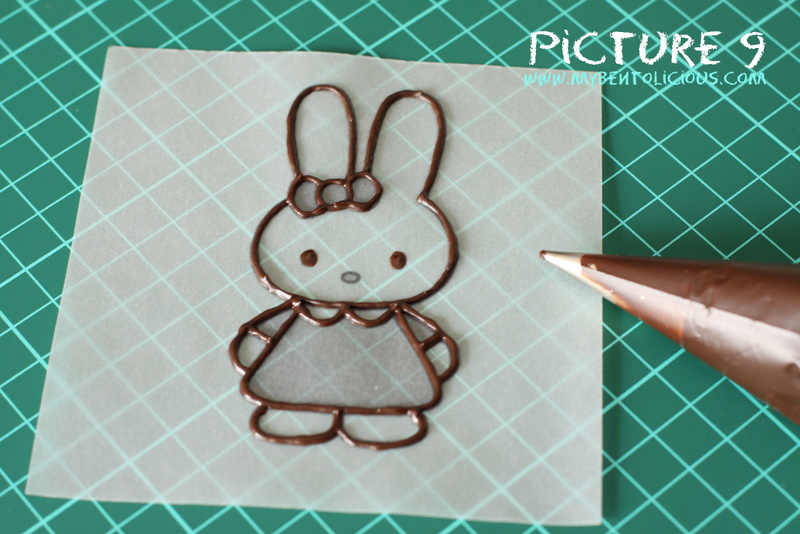 I've been wanting to attempt a chocolate transfer but I'm really afraid things might not turn out well. Googled and read alot but still couldn't find the time to make it. You have just inspired me to do it now. Probably after CNY when I get home of more chocolates. But I don't remember seeing so many coloured chocolates in Singapore. Anyway, your miffy rabbit is gorgeous! 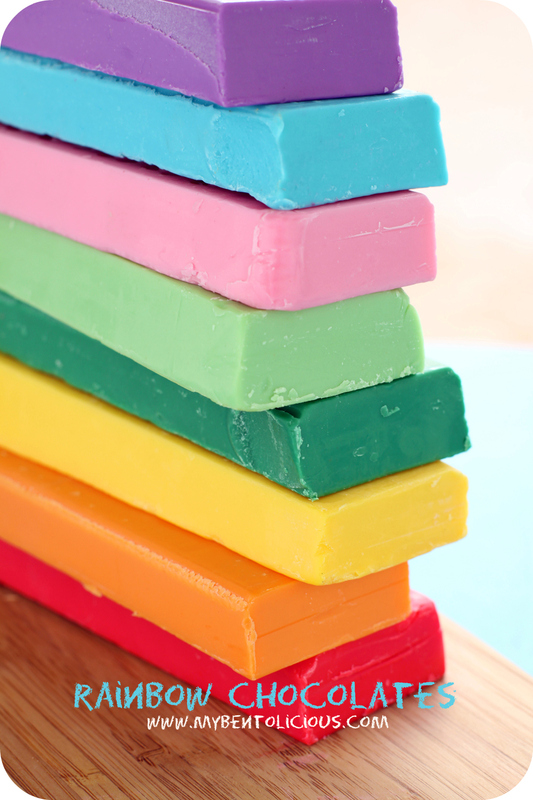 @Blessed Homemaker : I think you can find it from baking supplies shop, if they don't sell the rainbow chocolate block perhaps you can ask for Wilton's Candy Melts :) Thanks a lot for your kind comment! This is the cutest thing! Thanks for the step by step, and it brightened my day! 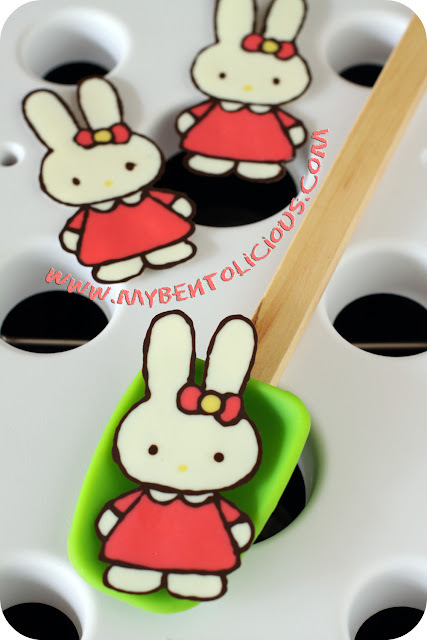 i'd love to paint with rainbow chocolates :)) Nice pictorial, Lia! Aw Lia, this is great ^_^. The colors, the patience, the precision. Pure art!!! OMG ... thank you soooo soo much for sharing the tips!!! you're awesome!!! I am sorry to hear you had a bad cough, hope you'll get better soon. This is just the best Lia. I just LOVE it! It looks quite professional and I love the squiggly outline, it gives the chocolate more of an artisanal feeling, more quality to it and character. Oh I so hope you're feeling much better now! The coughing is the absolute worst. I am doing all I can to clear away my sore throat. I know how tired you must be now. Stay well my friend. Thinking of you here. Take care of yourself this weekend. @Steph : Thanks a lot Steph! @That's Ron : Thanks a lot Ron! Thanks for your tutorial, this is awesome!!! That is so amazing!! My little one thinks that is the greatest thing! Wow! @Stephanie Rempe : Thanks a lot Stephanie! 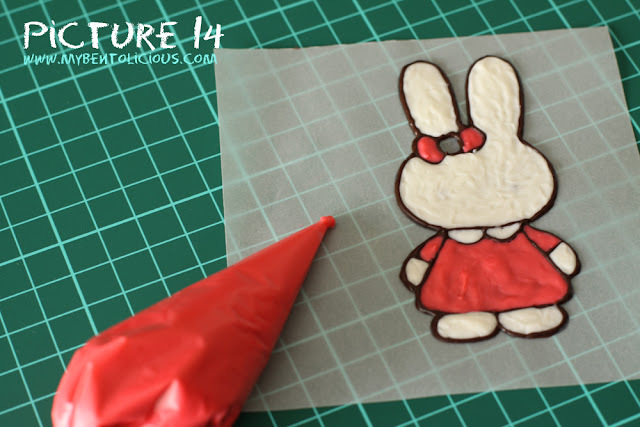 wow...I think it was the cuttest chocolate bunny I have ever seen! I think I would love to give it a try with candy melt. Thanks for the tutorial! SO beautiful Lia! Love love love it! What I got was either lumpy or too much oil. No matter how much/long I stirred after it melts. Did I do it wrongly or miss out any steps? Is there a Inet Chocoshop? That like came out so perfect. Hiii where can i cant rainbow chocolate in jkt? its sooo cute! thanks for the tips! @Czarina : Thanks a lot!